Jesse Woodrow in the role of “Mark Miller”. Yaron Urbas in the role of “Ismail”. Yaron has played everything from working class hero, relentless bad guy, soldier, mobster, to cultured entrepreneur in various principal roles for feature films. Sarah Himadeh in the role of “Parisa”. Sarah started her acting career in Canada. She moved to New York to pursue her dream, completing a 2-year Acting for Film and Theater Conservatory Program in the city and now resides in Los Angeles. Lance Blea in the role of “Amir”. Lance is a husband and father of six children. Lance loves acting and would rather spend 20 hours on set than eight hours at any other job. He loves playing sports, outdoor activities, eating great food, and spending time with family. Kerry Kehoe in the role of “Dr. Mahmood”. Kerry has been primarily a stage actor. His earliest training was as a Shakespearean actor in his native Ireland and he has played a multitude of Shakespearean characters over the years. In the the past ten years he has returned to stage acting and has appeared in indie films. Diana Castrillon in the role of “Roya”. Diana is a versatile, dynamic, and keen actor who has portrayed numerous roles, both in theater and on screen. She is currently involved with several indie films. Ryan Karloff in the role of “Muhammed”. Ryan’s recent film credits include “Grizzly Flats”, “Moviestar”, and “Through the Night”. Stage credits include “The Seagull”, “Twelfth Night”, and “The Diary of Anne Frank”. Earl Palmer in the role of “Sergeant”. Earl has been acting for 7 years now and has recently moved to Los Angeles. Irish born, in the UK he was in award winning national commercials, music videos, short films and award winning feature films. Francisco Medina in the role of “Mohsin”. 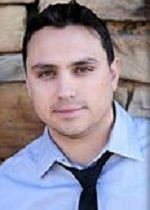 Francisco Medina is an actor living in Burbank, Ca. Discovering the traces of humanity as villain has been Francisco’s forte on film, his most recent casting as Mohsin in ‘The Miller Prediction’ is no detour. Connor Linnerooth “Lenz” Connor hails from Fargo, North Dakota. He can be seen in The Monuments Men, the short film Zone 2 and taking classes at “The Groundlings”. He recently graduated from the AMDA College and Conservatory of the Performing Arts and currently resides in the Los Angeles area. Mike Gaba in the role of “Farid”. Mike is part of a four generation New Mexican ranching family and have been an ardent traveler his entire life. He has been to over 100 countries, six continents and all fifty states. Vanessa Martinez in the role of “Shirin”. Vanessa got her start in acting at the age of 10 years old in community theater. At 14 years old Vanessa began auditioning for film and landed her first lead role in a short film shortly after. Christopher Mario Romero in the role of “Husayn”. Christopher spent a few years in the law enforcement field before taking an acting class that changed his world. He has found his passion in acting! He is still involved in helping the community by giving his time to several local charities. Everette Scott Ortiz “Ali” Everette made his screen acting debut at the age of 16 in the feature-film The Price of the American Dream II. Followed by roles in “Descansos”, “Coyote County Loser”, “I Am Alive: Surviving the Andes Plane Crash” amd “Far From Ascencion”. Rocky Ramirez “Haj Hassan” Rocky has done stunt work for “Force of Execution” played gangster. Movie roles: FELON, FRANK, MILLION WAYS TO DIE, TV pilot STANISTAN, KING OF CAGE box set, SPIKE network BELLATOR. Jason Jaramillo in the role of “Hakim”. Jason has been acting since he was a teenager. He has acted on stage and in YouTube videos. This is his first appearance in film. He is excited to be a part of the magic and looks forward to more artistic opportunities. Maria Rudolfo in the role of “Golnoosh”. Maria Rudolfo makes her debut as Golnoosh. She is an avid reader who enjoys music and gardening. She enjoys spending time outdoors with her husband and daughters. Arturo Maese Bernal in the role of “Teric”. Arturo is currently a student at CNM, majoring in Performing Arts. His dream has always been to become an actor since, and now that dream became a passion, and that passion has become a goal.